This station is also known as Robert J. Cabral Station in honor of a late county supervisor in his role in establishing ACE. This station is also the administrative headquarter for ACE. Altamont Corridor Express trains serve this station during weekday peak hours only. Buy ACE tickets at the station lobby. An ACE 20-ride validator is located on the platform by the large canopy. This station features a single platform. All trains depart on the same track. 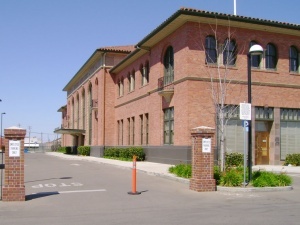 Only San Joaquins trains serving Sacramento stop at this station. San Joaquin trains serving Oakland stop at the station on San Joaquin Street in Stockton. Amtrak provides bus service shuttling passengers between these two stations. Amtrak trains do not stop at the platform. Trains stop to board passengers on Weber Ave grade crossing immediately south of the ACE platform. Buy Amtrak tickets through a QuikTrak machine. Free parking is available at the station. Free gated parking is available at the lots south of Weber Ave. This page was last edited on 12 December 2018, at 17:39.